Performers dance and sing the Sarawja for the celebration of Holy Week in Carumas. In the Moquegua Region of the southern Andean highlands, Tixani Valley communities inherited many pre-Inka traditions. Over time, they developed artistic expressions based in this heritage that have come to represent their own cultural identity. The Sarawja dance, performed for Christmas and Easter celebrations, is emblematic of the towns of Carumas, San Cristóbal, and Cuchumbaya. Dancers who moved to Moquegua city return home every year to join the festivities. Groups dance the Sarawja (meaning “let’s go” in Aymara) in streets and plazas, traveling from house to house and town to town, singing and whistling to rhythms of the charango. They form circles in which men play music and sing while dancing zapateado (a tap-like step), and the women sing while twirling in a circle. The verses are often improvised and allude to love, locality, suffering, and disappointment. 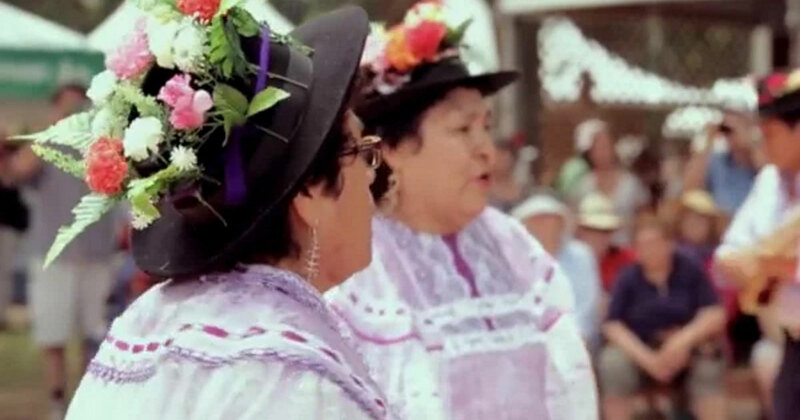 The Catacora sisters grew up singing at home and performing during celebrations in Carumas. They formed the group Tradiciones Carumeñas to help promote and diffuse Tixani Valley culture. In addition to danza Sarawja, the group celebrates other home traditions that are passed from generation to generation. Tradiciones Carumeñas presents the Sarawja dance in the main plaza of Carumas. Music and dance group Tradiciones Carumeñas poses with Moquegua Director of Culture Deisi Rivadeneira Gámez in the main plaza of Carumas. A musician and dancer rehearse a Sarawja song. The Sarawja verses, which are occasionally improvised, interpret everyday life as well as the singer’s deepest feelings.